Model T Ford Forum: How 'bout a 2 lever town car? How 'bout a 2 lever town car? Model T Ford Forum: Forum 2014: How 'bout a 2 lever town car? 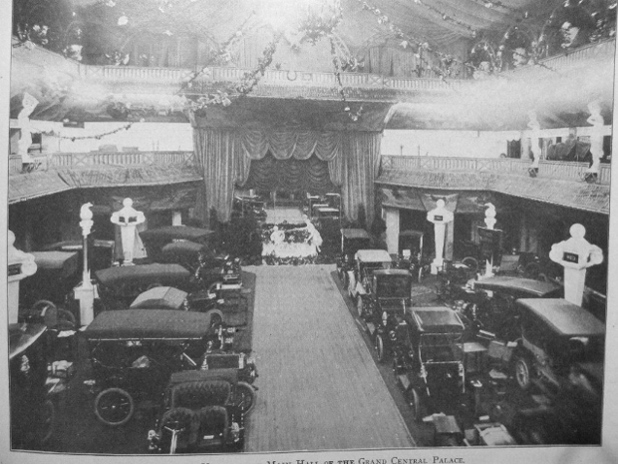 If you look real close and know what you are looking for there is a 2-Lever Coupe behind the Towncar There is also a Landaulet in the Lineup at this show in New York at the 1st showing of the Model T at the Grand Palace Dec 31,1908. Thank you for sharing there are always more �new for me� items that I want to learn about. You could be correct that only two models were initially announced. But I've found that it is helpful if we can add supporting documentation to such statements. Often times what I say is based on what I have heard from others or that I remember from memory. A quick review of my test scores in school reveals I often recalled the answer to the test question incorrectly. At: https://www.thehenryford.org/exhibits/pic/2008/08_jan.asp they have a copy of what I remember [didn�t we just discuss that limitation?] as being the first public advertisement for the Model T Ford which was a full page in the �Life and Saturday Evening Post�. They list it as the Oct 1, 1908 issue but since the official Saturday Evening Post site http://www.saturdayeveningpost.com/2011/10/01/history/post-perspective/ad-announ ced-revolution.html has it listed as Oct 3, 1908 � it is likely the Oct 3 date is more accurate. And the magazine probably would have been printed before that. That advertisement only shows and only mentions the touring car. But it never says that is the only one available. At: http://www.mtfca.com/books/1909.htm Bruce McCalley (R.I.P.) 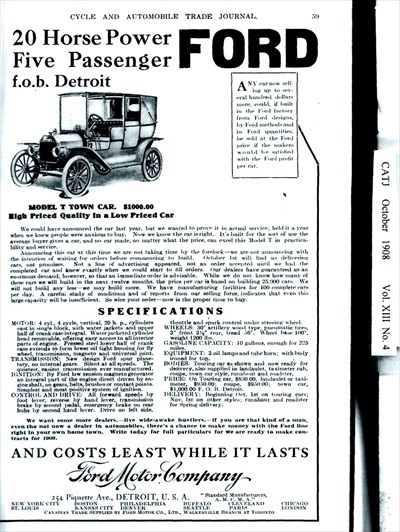 reproduced an advanced Model T sales catalog. While the two-lever three pedal configuration was not what actually went into production, it also only listed the Touring car but again did not say that it would be the only car available. At http://www.mtfca.com/books/1909cat.htm Bruce provided a Jan 1909 sales brochure that had 5 models displayed and available. Does anyone have an earlier advertisement or brochure showing additional models? Royce thank you for posting the additional view from the same time frame. Again, thank you and others for posting the photos -- I think we all will enjoy watching what has been recently released. http://www.mtfca.com/discus/messages/331880/390344.html?1380280721 It has a news paper advertisement for the T and it shows only the touring and the Landaulet (not town car). It calls the Landaulet a Model �W� and not a Model T. Both of those chassis have the Model N, R, S, and SR features outside shifter on right for the transmission � and easy to see on the Landaulet but I believe it is also there on the touring � the pair of full elliptical rear springs one on each side of the rear axle. Of course they are illustrations and the artist can and did draw them the way they wanted to draw them. So it initially appears there may not be a nice �black and white� answer to the question/claim. Once again it appears that Model Ts maybe more analog than digital. The two lever Town Car, yes, we read about that yesterday. 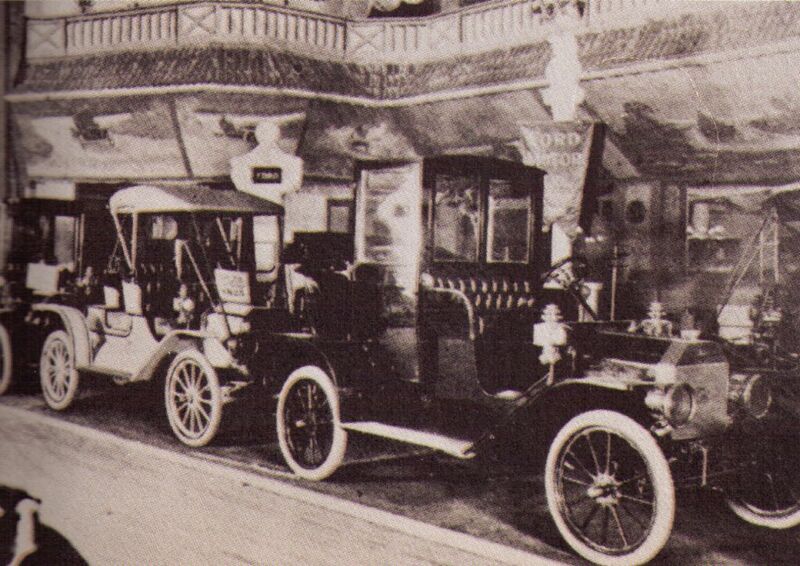 I believe the photos on the last link you posted, advertisements for the T touring and W towncar, were for the winter 1907 Grand Palace show, showcasing models for the upcoming 1908 model year. The Ford Times does make mention of a towncar sold in Rhode Island in December 1908. 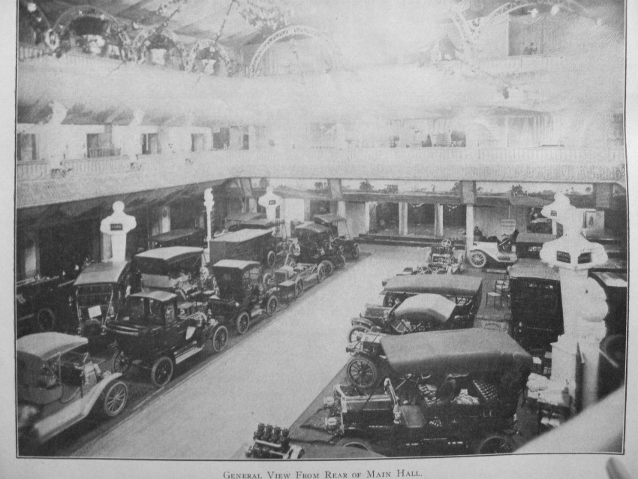 Yes, the timing of the advertisement would line up well with the Grand Palace Auto Show introducing the cars for 1908. I don't have data readily available for when that even occurred in late 1907 or early 1908. But that makes sense. Especially if the location in the advertisement was New York, New York. To my knowledge there was never a left hand drive production Model N, R, S, or SR. 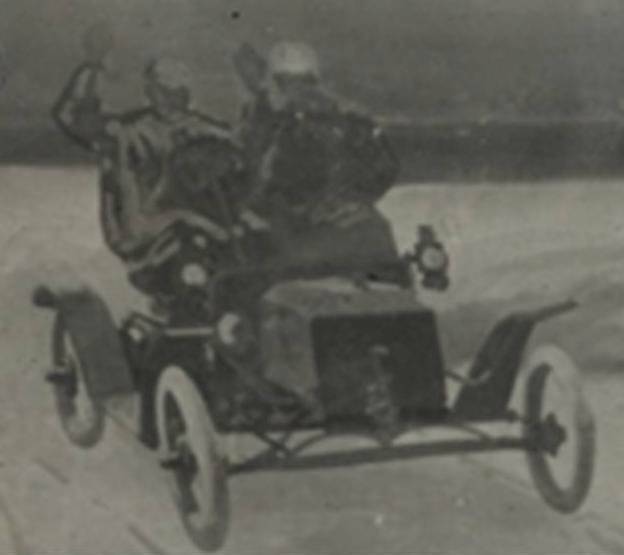 However, there were quite a few Model T ideas that were tried out on Model N chassis & cars. I have heard those are sometimes called "mules" and depending on how close to the Model T they were, they are often called prototypes. For the example of where they tested the idea of the removable cylinder head see the story at: http://modelt.org/discus/messages/2/35597.html?1329156233 -- scroll down to the Model N engines around Feb 12, 2012 8:07 PM to cut to the chase or the are also shown earlier at: Feb 08, 1021 9:03 PM. So it is likely that the bracket and possibly the steering column etc. were tested on a Model N, R, S, or SR chassis. In the case of the mural on the wall the higher resolution shows it is actually Right Hand Drive and not left hand drive. But it did look sort-of like LHD in the earlier posting. And the higher resolution also shows that it has the running boards so it is not a Model N. And it doesn�t have the rounded cowl so it is not a Model S Roadster. That leaves the Model R Runabout and the Model S Runabout. Really hard to tell with a front on shot as the rear deck is the distinguishing feature. The Model S Runabout had the pointed rear deck and 28 x 3 clinchers and the Model R Runabout had the rounded rear deck and the 30 x 3 clinchers. Since it is a drawing it could be either very easily or even a combination of the two. I think the driver and passenger may be wearing wet weather gear (slickers). Note the driver is holding his hands up and they are not on the wheel. Remember doing that riding our bicycles when we were a kid? If anyone does have any information about a left hand drive Model N, R, S, or SR please let us know. It would also have required some changes to the earlier RHD transmission pedals etc. I have, and can confirm the photo in the start of this thread is the car shown at the NY Grand Central Palace Show, Jan 1, 1909. The show began on Christmas Dec 31 afternoon for private showing and then on Jan 1 1909 for the public. 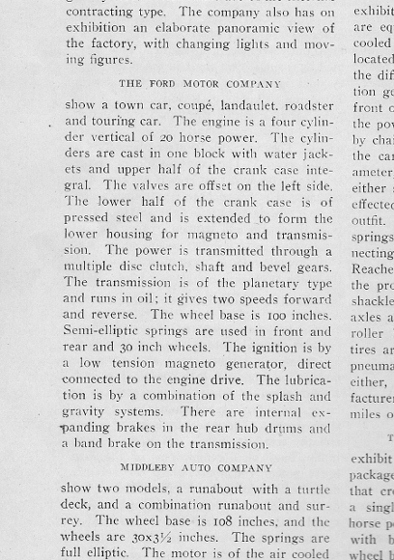 Ford showed 5 models of the new Model T there. Note the statues and the illustrations on the walls and decore, certainly the photo of the Town Car is from this display. Pictures shown in the The Horseless Age magazine, dated Jan 6, 1909. If the owner had a Warford and a Ruxtell, he would have really had his hands full. Thank you for the additional photos and information for the Dec 31 1908 private showing and Jan 1 1909 open to the public show at the Grand Central Palace. That is the car show we care more about because the Model T Fords were displayed there. It was most likely the first public USA Auto Show that the Model T participated in. [They had been in the English Auto Show and French Auto Show prior to that in Nov 1908. Ref page 57 Stern�s �Tin Lizzie� that has the correct dates but the wrong photo for the London Auto show [Olympia Exhibition see: for additional details about that show and the wrong photo and how the folks working on the English Ford book figured out it was the wrong photo please see: http://modelt.org/discus/messages/2/1884.html ]. � And thank you again for those additional photos and information! But I'm fairly certain that other thread and the advertisement there showing the Landaulet (not town car) is a year earlier. 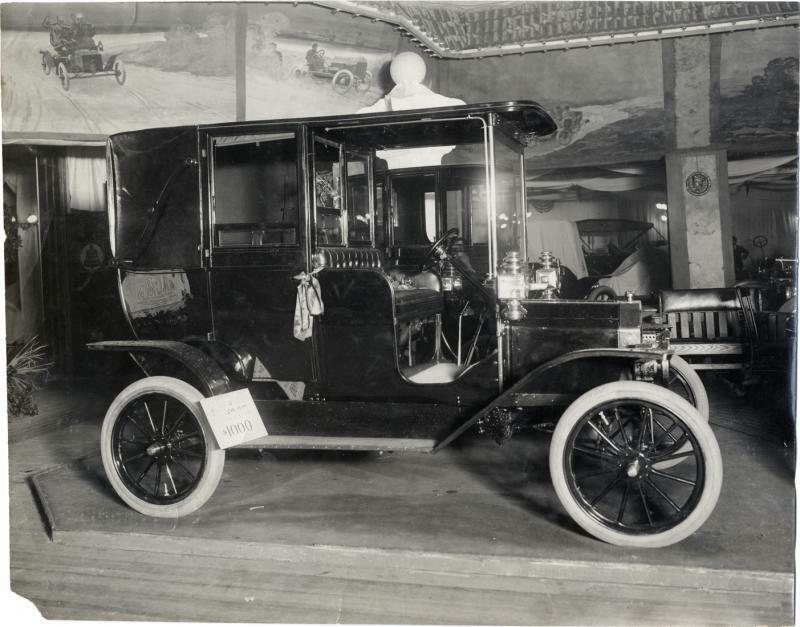 As mentioned previously in this thread about that advertisement [not the photos in the current thread] it calls the Landaulet a Model �W� and not a Model T but it did call the touring car a Model T. Both of those chassis have the Model N, R, S, and SR features such as outside shifter on right for the transmission � and easy to see on the Landaulet but I believe it is also there on the touring � the pair of full elliptical rear springs one on each side of the rear axle. Of course they are illustrations and the artist can and did draw them the way they wanted to draw them. And for the auto show the year earlier I don't know if it was the same sort of Dec 31, 1907 private viewing and then open to the public Jan 1, 1908 for a week or so or not. It will be neat to see more and more of the photos that will be discussed. coupe, town car style, runabout and roadster. $1,000.00 V. O. B. Detroit. So runabouts weren't produced until later. Were there any two lever runabouts made? Cars built in early November 1908 would still be 2 lever. The ad states delivery November 1st, so the car would have to be built prior to that date. The three pedal cars began perhaps around serial number 850, about mid November 1908. There were town cars and runabouts built in the first 850 cars. I looked at my notes from examining shipping records in the Accounts Receivables Ledgers at the Benson Ford archive in 2007. Here are the shipping records for Model T's I found in the pre - S/N 1000 range. The earliest runabout in my notes is this one, but I doubt it was the earliest one sold. Bear in mind that I only examined perhaps 20% of the Accounts receivables, and they are not complete. The ledgers might capture 20 - 25% of production, perhaps. Words can be confusing -- coke, cola, soda, etc. For the 1909 Model T line up � Ford USA produced a light car with two seats up front and one seat in the rear (mother-in-law seat). It is often called a Roadster, Runabout, Mother-in-Law roadster, and words I shouldn�t put here when it left the owner stranded in the middle of nowhere back in the day. I use the tem Mother-in-Law Roadster which was NOT what Ford used but which helps folks know which body style I am talking about. We know the one light colored Mother-in-Law Roadster in the photos above at the auto show would have been a two lever. From Trent�s �Early Ford Database� he has Car #458 listed as being shipped Jan 16, 1909 to Standard Motor Car Co. San Francisco, CA. It is listed as a Model T Roadster. While we cannot say for sure that it was a two lever [the last two lever that I know of is serial # 839 on display at the Henry Ford Museum (see posting at: http://www.mtfca.com/discus/messages/29/35743.html ) we can say that it likely could have been a two lever. Trent�s database was taken from the Accounts Receivable Ledgers. They are missing about 75-80% of the ledgers so his listing only contains approximately 20-25 % of the cars for a given time frame. And he only does Model T #1 through 1114 as the shipping documents are available for numbers 1,119 starting Mar 3, 1909 into the 1911 year. He also has car #810 shipped Feb 13, 1909 and #829 shipped Feb 16, 1909 listed as Roadsters. Those may have been two levers but it is less likely than # 458 that was shipped about a month earlier. Note � a very rough estimate of 227ish Model Ts are listed in Trent�s data of the first 1,118 cars which is about 20 percent of the Ts produced. Of those only 3 were listed as Roadsters for about 0.003 percent. Of the 227 listed it would be 0.01 percent were roadsters. And if we use that 0.01 times the 1,118 we would have about 11 roadsters during that time period. So clearly not that many. They could have thrown us a curve ball and shipped a bunch of roadsters to several of the agents that the ledgers were lost � in that case we didn�t know about it and it didn�t follow our prediction. But for sure they made more touring cars at first than other styles. Hap, Serial number 458 would definitely be a two lever car. The earliest documented original three pedal cars are above serial number 850.